Bristle Pipe Cleaners are the perfect tool for cleaning tough resins from your pipes. These pipe cleaners have tough bristles on them that are designed to scrape through tough messes. They are great at getting in to curved pipes because they bend easily. They come in a pack of 44 pipe cleaners. Integra Boost Humidiccant humidity control packs use patent pending technology that releases AND absorbs moisture - maintaining the desired relative humidity in a contained environment. This humidiccant packet will control your moisture consistently and effectively without corrosive ingredients...and without effecting smell or taste! Each packet contains a replacement humidity indicator. (8g 62% R.H.). 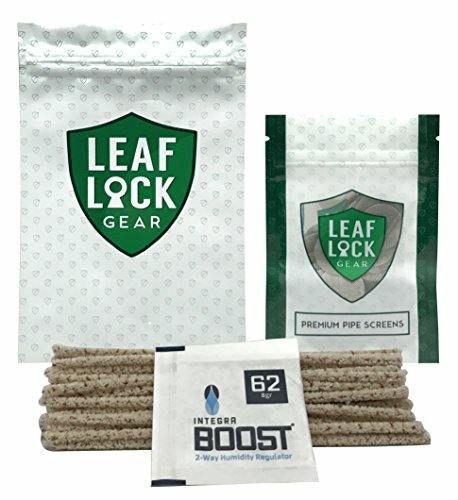 Leaf Lock Gear Smell Proof Bag 4x6"
Integra Boost 8 Gram Humidity Regulator 62% R.H. If you have any questions about this product by Integra, Leaf Lock Gear, contact us by completing and submitting the form below. If you are looking for a specif part number, please include it with your message.